[0:57] <darkdrgn2k3> kinda like an auto answer handless device?! [1:02] <friendofafriend> Try "twinkle -c"
[1:02] <darkdrgn2k3> 2009 does it still work? [1:02] <friendofafriend> Uh oh, might be expired. [1:03] <friendofafriend> Super great, fantastic. [1:04] <darkdrgn2k3> i know right! [1:04] <friendofafriend> Welcome, good luck. [5:34] <CoJaBo> Masterph_: sure the image isn't corrupt? [5:35] <DanielTheFox> shouldn't the image come with a partition table and all the partitions needed for proper bootup? [5:38] <ball> Does anyone have a recommended USB 2.0 to SATA cable that they'd use with a Raspberry Pi? [5:41] <ball> That may be impractical, in which case I'd have to resort to a USB flash stick. [5:43] <ball> I /might/ get a 60W multiport USB "charger"
[5:44] <ball> DanielTheFox: I've given up on disks for now, though I suppose the headnode could have one. [5:49] <ball> ...and that's not including cables. [5:54] <ball> $254, excl. cooling fan and mounting hardware. [5:55] <ball> I have two Raspberry Pi model B (one untested) and a 2B. [13:43] <PCatinean> Does anyone know what is the best way to get the basic libraries needed for GPIO operations in a docker image? [13:47] <PCatinean> hmm, they are? [13:52] <ShorTie> what sensors if i can ask ?? [16:18] <digital> the file /boot/config.txt is parsed before start.elf is loaded, right? [16:44] <DanielTheFox> attempting to load 64-bit OS? [16:45] <digital> how do I boot a raspberry pi 3 from an u-boot shell? the instructions given in https://elinux.org/RPi_U-Boot#Booting_from_an_SD_card are apparently outdated, the u-boot I downloaded and compiled today don't have the `bootz` command. [16:46] <PhotoJim> I remember being excited getting a computer with 64 kB of RAM. but that's true, if you want a GUI, 1 GB ain't much anymore. [16:52] <PhotoJim> I have a Pinebook, too, but I haven't used it much lately. need to reinstall it. I borked it. [16:53] <PhotoJim> I have a 486 with 32 MB RAM that runs Debian kicking around, mostly for kicks. It was my first-ever Linux machine. but I broke a kernel upgrade so it needs help. [16:53] <PhotoJim> but when last it ran, although it ran slowly, it definitely ran. [16:53] <PhotoJim> you could probably upgrade that to 32 or 64 MB pretty easily. [16:54] <PhotoJim> this 486 I have was so old, it was ISA and used 30-pin SIMMs. [16:54] <PhotoJim> I wish it had PCI. then I could put a USB card into it. [16:54] <PhotoJim> oh, it's one of those hybrid machines. [16:55] <PhotoJim> that's the generation that started having PCI slots. guess yours was a little too early. [16:55] <PhotoJim> right. so use 30-pin and you'd have 32 MB. use 72-pin and you'd have 64 MB. [16:55] <PhotoJim> well, 8 MB 30-pin SIMMs are rare. so you're definitely better to go 72-pin. [16:56] <PhotoJim> oh, that's unfortunate. [18:27] <DanielTheFox> no, what's that? [18:27] <galtj> is there some SID-like "expansion pack"
[18:40] <burner01> is .raw the same as .img or is there a conversion needing to take place? [18:44] <RoyK> burner01: using centos on a pi? [18:46] <burner01> i can do headless. [18:47] <burner01> so .raw is ok to use and doesn't need a file extension of .img? [18:49] <burner01> Yeah, I mean i don't hate it, we all just have our preferences. [18:51] <RoyK> you did decompress the file before you dd'ed it over to the card? [18:53] <burner01> Yup there is. [18:54] <burner01> 2, :\ but i've read 2 works. [18:55] <burner01> Yeah, I don't mind headless, but it's simply just not booting. [21:18] <friendofafriend> You might try using rpitx, eject_ck. [21:31] <eject_ck> @friendofafriend: it works! [21:32] <friendofafriend> You're very welcome, eject_ck. rpitx is much more full featured, allowing for transmission of AM, sideband, and lots of other modulations. [21:32] <eject_ck> Any works to broadcast DVB-T ? [21:32] <friendofafriend> Just be careful, adding an antenna can make your transmissions travel for quite a distance and cause interference to others. It's smart to use a filter. [21:33] <eject_ck> are you using it ? [21:34] <friendofafriend> rpitx? Sure, I've used it before. 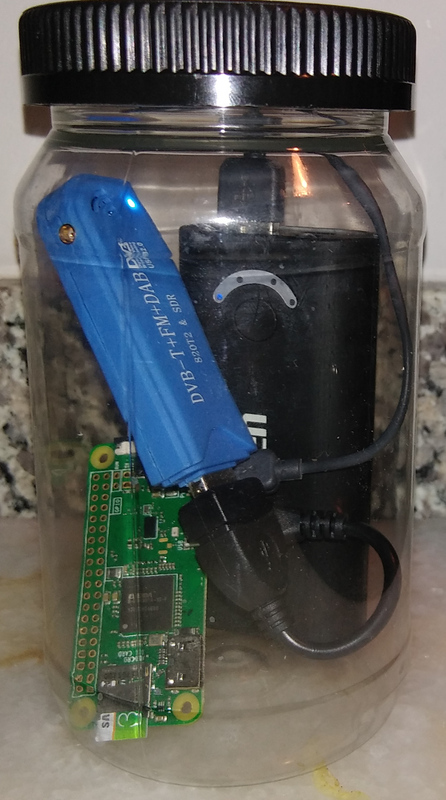 [21:34] <friendofafriend> In fact, you can set it up to read I/Q samples from a pipe, and then transmit from the Raspberry Pi from GNURadio on another system. [21:36] <friendofafriend> Was using GNURadio and rpitx to send data to a ChipCon radio, the CC1101. [21:37] <chris_99> would it be right in thinking that pi script, uses SPI? [21:41] <friendofafriend> chris_99: That script is (ab)using the GPIO clock. [21:41] <chris_99> oh interesting, how's that work roughly? [21:52] <friendofafriend> There's considerable advancement since the proof-of-concept. I think the real star of the rpitx show is csdr, I can't live without it. [22:00] <eject_ck> friendofafriend: what's csdr ? [22:00] <friendofafriend> eject_ck: You're using it. [22:01] <friendofafriend> csdr is a program for doing DSP that can be optimized for your processor, it takes advantage of NEON, SSE, and other instruction sets. [22:10] <eject_ck> friendofafriend: can you suggest how to stream to stdout mp3 stream ? [22:11] <friendofafriend> Uh, sure, but I don't understand exactly what you want. [22:12] <friendofafriend> You have an mp3 file and you're trying to stream out, like WAV? [22:13] <friendofafriend> Probably something like, "ffmpeg -hide_banner -loglevel panic -i yourmusic.mp3 -f wav -acodec pcm_s16le -ac 1 -"
[22:13] <friendofafriend> Cool, is that working out? [22:14] <friendofafriend> You are always very welcome. I'm glad you've got an RDS radio to test! [22:28] <eject_ck> friendofafriend: any works to make DAB? [22:28] <friendofafriend> To have it broadcast DAB? [22:34] <friendofafriend> And you could probably make a recording of the I/Q file that results, and test transmitting it through rpitx. [22:37] <eject_ck> friendofafriend: sorry can you clarify about recording? You asking to record my broadcasting or ? [22:38] <friendofafriend> No, are you trying to transmit DAB from the Pi? [22:38] <friendofafriend> It's a bit more complicated than the examples. [22:41] <friendofafriend> Yes, you could probably get the Pi to transmit DAB. [22:43] <eject_ck> how it's detected ? [22:49] <friendofafriend> eject_ck: Use an osmocom source block, in the device arguments put in "rtl=0". [23:01] <eject_ck> I have rtl=0, what you mean by "osmocom source block" ? [23:10] <Khaytsus> You were close! [23:21] <Khaytsus> Most vpns have random stuff in 'em..
[23:41] <friendofafriend> Khaytsus: Mainly for national security applications? [23:49] <friendofafriend> Stop snitchin', Khaytsus.